"There is one word you can take away from this: excitement," Jaffe said. "And that's because we're not trying just to solve a problem here or there, but we are trying to develop a new way to think about mathematics, through developing and using different mathematical languages based on pictures in two, three, and more dimensions." "There has been a great deal of evolution in this work over the past year, and we think this is the tip of the iceberg," Jaffe said. "We've discovered that the ideas we used for quantum information are relevant to a much broader spectrum of subjects. We are very grateful to have received a grant from the Templeton Religion Trust that enabled us to assemble a team of researchers last summer to pursue this project further, including undergraduates, graduate students, and postdocs, as well as senior collaborators at other institutions." While images have been used in mathematics since ancient times, Jaffe and colleagues believe that the team's approach, which involves applying pictures to math generally and using images to explore the connections between math and subjects such as physics and cognitive science, may mark the emergence of a new field. "We developed this, motivated by several ideas from Ocneanu," he said. "Immediately, we used this to give new insights into quantum information. But we also found that we could prove an elaborate algebraic identity for formula 6j-symbols," a standard tool in representation theory, in theoretical physics, and in chemistry. "By looking at the mathematical analysis of pictures, we also found some really unexpected new inequalities. They generalize the famous uncertainty principles of [Werner] Heisenberg and of [G.H.] Hardy and become parts of a larger story," Liu said. "So the mathematics of the picture languages themselves is quite interesting to understand. We then see their implications on other topics." "I am very taken by this project, because before this, I was working on quantum information, but the only way I knew to do that was using linear algebra," said Bu. "But working with Arthur and Zhengwei, we've been able to use this pictorial language to derive new ideas and geometric tools that we can use to develop new quantum protocols. They have already been useful, and we foresee that these ideas could have wide-ranging applications in the future. "It's amazing, I think, that we can use a simple pictorial language to describe very complicated algebra equations," Bu continued. 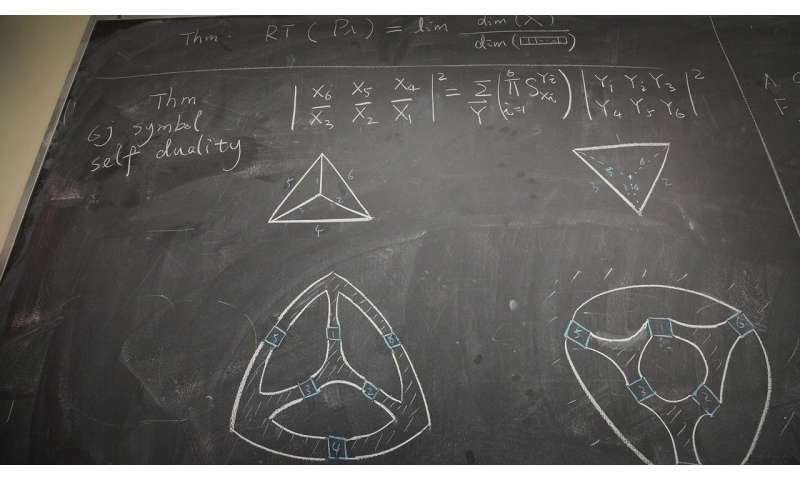 "I think this is not only a new approach, but a new field for mathematics." Ocneanu interjected, "Ultimately what higher-dimensional picture language does is to translate the structure of space into mathematics in a natural way." "Space, or more generally space-time, is a kind of computational machine," said Ocneanu. "We should really translate what space is doing into the kinds of things mathematicians use, so we can read the structure of space." "My background is in representation theory; my thesis is in this area of math called geometric group theory," he said. "So with a background of using pictures and geometric objects, it helps to apply mathematics in this way. We're still trying to realize this, but if this all goes through and succeeds, you've got a very beautiful area of mathematics where you start with just a few axioms, and just from that beginning you can generalize this highly nontrivial theory with this beautiful structure." "We hope that eventually one can implement the ideas we are studying in new theoretical-physics models, as well as in some practical terms," Jaffe said. "To share in our excitement, take a look at our website."